Our building, completed in 2003, was custom designed as a green retreat centre, using most of the sustainable energy technologies available. It was voted one of the greenest buildings in Canada. 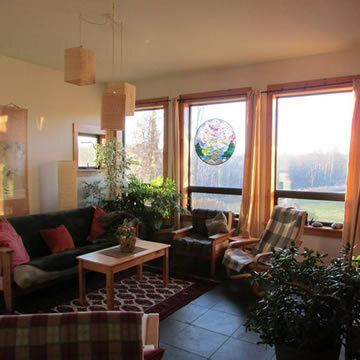 It also incorporates Andy’s and Nicola’s Feng-shui and Yin-Yang knowledge, which endows the building and its surroundings with a harmonious, safe, cozy, in-nature feeling, commonly noted by our guests. It is nestled into a hill top overlooking Rice Lake, surrounded by 50 acres of rolling meadows and healing forest, which lead to the swimming-friendly lake. One of our guests, a noted shaman, informed us that we had located our building in the centre of a giant Medicine Wheel and conveyed supportive messages to us from the ancestors, animals, birds (including 3 rare golden eagles) and rocks. 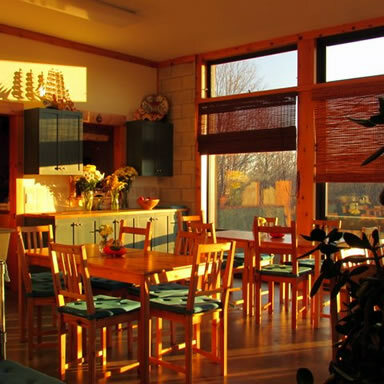 Our retreat centre is open all year apart from December and January. 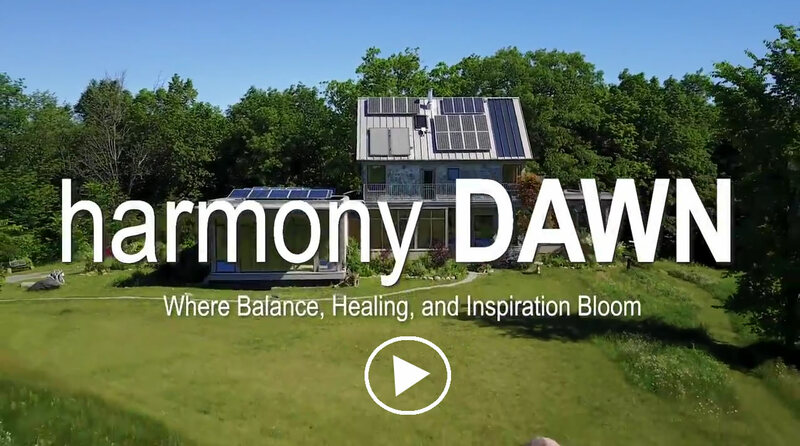 Harmony Dawn (HD) is designed to work with the external environment to minimize heating and cooling energy usage and provide a comfortable year-round living environment. It is highly insulated, captures heat and energy from the sun and is designed to promote air circulation. We have used non-toxic, environmentally friendly building materials like wood, bamboo floors, stone, and slate. We have a few area rugs but no carpeting. We invite our guests to help us in mindful usage of resources and in simple building management like opening or closing windows, letting in or keeping out the sun, turning off lights and water conservation. Most of our power comes from clean, renewable sun and wind, but even in the worst case energy or weather scenarios, we will always have power and water, since we have independent back-up systems. Our building consists of 3 interlinked pods. 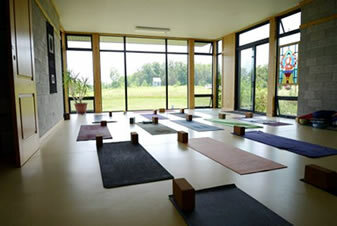 The western pod is our studio, used for meditation, Tai Chi Chuan, yoga, activities and meetings. The back of the studio is bermed into the top of the hill, while the front offers sunny, expansive views of rolling hills through our 10-foot, floor-to-ceiling, high-tech windows. You feel as if you are sitting out in a high, open meadow and indeed foxes, turkeys and deer occasionally walk by. Berming is the technique of totally or partially covering a building in earth to take advantage of the temperature of the earth, 55 F or 13 C., through all seasons. Our studio also has radiant-heated floors, which can adjust to the required room temperature. There is a living “green roof” over the studio. Our central pod houses our living room, bedrooms and washrooms and is also partially bermed. The ground and second floors have 10 foot ceilings and our loft ceiling is even higher. All floors boast large windows; all washrooms have heated floors. There are radiators on the second and third floors and in the living room, there is a wood-burning, glass-windowed masonry fireplace, which heats all three floors and provides a warm and cozy winter ambience, very popular with our guests. Our sleeping accommodation is mostly shared because we are convinced that “one bedroom and washroom per person” may be fashionable now, but is environmentally extravagant and unsustainable. We encourage all our guests to help us take care of Mother Earth and her resources. We are a “retreat centre” in the sense that we provide a safe, comfortable and nurturing environment for healing, creative and spiritual work, which includes a sense of community, sharing and cooperation. How can we profess to cultivate Universal Love if we don’t want to share a room with someone else? We encourage our guests to Disconnect in order to recharge and Reconnect to Nature and their deeper selves. The eastern pod, which houses our dining room and kitchen, offers views of the front meadow as well as our ravine and stream. On a sunny winter’s day, the dining room may be 25 degrees or more even when it is minus 25 outside. There is a small solarium off the dining room for those who enjoy tranquility, reading or simple gazing at nature and our popular bird feeder. In warmer weather, guests can eat outside under our majestic, red oak tree. Not far from our building is a rock circle fire pit and an insulated sleep cabin, which can accommodate two. 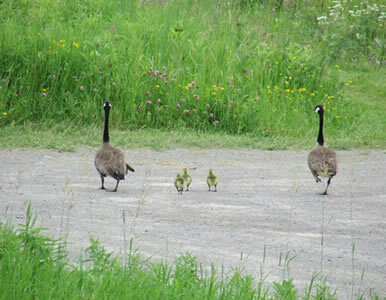 One of our most precious facilities isn’t actually a facility, but our land - Nature itself. Our unique 50 acres of rolling meadows and forests are beautiful, organic, tranquil and healing. They buffer us from the everyday world of noise, pollution, traffic, stress and close neighbours. Our building is a sheltered half kilometer away from a quiet country road. Arborists, biologists, and historians have informed us that our air is clean and highly oxygenated; our forest trees are varied, healthy, healing and medicinal. Research has shown that walking in a city park is more healthful than walking on streets and walking in a healthy rural forest is more healthful still; other studies strongly suggest that Nature heals us in many subtle mind-body ways. At Harmony Dawn, you may sit on large, ancient rocks in our meadows or forests to serenely reflect on Nature, Life or Nothingness. If you are attentive, you can smell Nature’s subtle perfumes and watch the fascinating dance of meadow grasses, floating clouds or fluttering leaves, not to mention our bird and animal friends - woodpeckers, hawks, eagles, owls, deer, wild turkeys, foxes, coyotes, wolves, bears, pine martens, turtles, and even a rare moose and pristine white ermine. 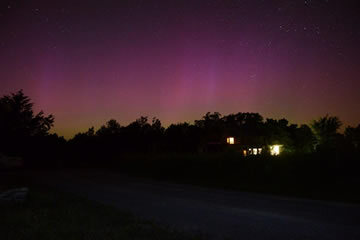 During our ultra-dark nights, observe millions of fire flies, shooting stars, the Milky Way or perhaps the Northern Lights, Aurora Borealis. Our land is rich in history, particularly Native. Our hills are part of the planet’s highest concentration of Drumlins, left behind by receding glaciers. Ancient stone tools have been found on our property by an anthropologist guest and by ourselves. The last major battle between American native tribes took place within a kilometer or two from our property. Rice Lake was prized among the tribes because it was actually covered with wild rice and full of fish, mussels and more. The famous Serpent Mounds are just across Rice Lake and the Petroglyphs are about 40 minutes away. Rice Lake is part of the Trent-Severn Waterway and is renowned for its fishing and warm swimming. Harmony Dawn is just 90 minute from Toronto.